Perhaps for the first time ever, Canada has a shot at leading the world in a new economic activity. An employee collects cuttings from cannabis plants at Hexo Corp's facilities in Gatineau, Que. Derek Peterson is worried about Canadian weed. The CEO of California-based marijuana producer and seller Terra Tech is watching the cannabis industry boom north of the border with more than a little apprehension — because he is already seeing the beginnings of an invasion of U.S. markets by Canada's cannabis firms, today the world's largest. "The concern for some of the players is the market will be dominated by Canadian companies, shareholders and banks if we allow too much time to pass," Peterson said by phone from California. With Canada set to legalize recreational marijuana on Oct. 17, Canadian cannabis stock prices have soared, giving these startup firms enormous amounts of money with which to invest in their business. Meanwhile, U.S. companies, encumbered by the country's continuing federal prohibition, aren't seeing nearly the sorts of valuations Canadian companies are seeing. "They who have capital get to soak up market share," Peterson said, adding that Canadian companies are "capitalizing themselves extremely well and doing arms'-length investments in U.S. markets, locking down branding opportunities and buying players." Peterson figures the U.S. has only a few years to "get its act together" and reform marijuana laws at the federal level, or Canadian companies stand to win the game. "If we don't see something happen in 2019, almost all of us will be takeout targets for Canadian players," he said. There's a lot at stake. One recent estimate suggested the U.S. marijuana market could be worth about US$90 billion a year if it were legalized across the country. These forecasts tend to vary widely, but it's clear that giant green fortunes stand to be made. Cam Battley, chief corporate officer at Edmonton-based Aurora Cannabis, thinks there's nothing wrong with Canada being the one to make those fortunes. "When was the last time Canada got to lead the creation of a new industry worldwide?" he asked by phone from Berlin. "As much as I absolutely love the United States ... I don't think there's any law that says the U.S. has to dominate every new industry in the world." In the past year, Aurora's stock price has quadrupled as investors anticipate a major boom in revenue after Canadian legalization. That and its takeover of rival MedReleaf earlier this year has made it the world's largest cannabis company, valued at more than $11 billion. 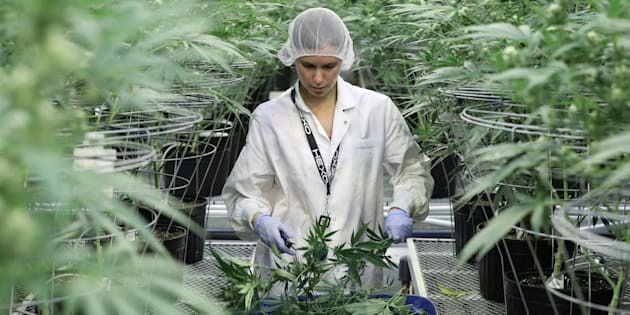 Battley calls Canada's leading role in cannabis an "accidental success story," one that started with the country's Supreme Court forcing the federal government in 2001 to create a mechanism for medical marijuana patients to access the herb legally. The government of the time "did something smart," Battley says — it instituted a licencing system for private marijuana producers, which created a competitive environment for medical cannabis. This was the seed of today's booming industry, Battley says. And today, with the Liberal government legalizing recreational marijuana at the federal level, the world is watching to see what the results will be. "I would say the world trusts Canada to be the leader on this. We're not known for being wild and crazy. We're known for being very good at public policy." Aurora Cannabis chief corporate officer Cam Battley in Vancouver, B.C., Fri. Jan. 27, 2017. Aurora's own business plans show just how internationally-focused the Canadian industry has become. Battley boasts the company has established footholds "on five continents" and in 18 countries where medical cannabis is legal, and further expansion is on the way. He's convinced Canada will lead the world in the cannabis industry, which he believes will be larger than the beer industry, once it's fully matured and includes things such as edibles and cannabis drinks. But when it comes to the U.S., a Canadian invasion may not be so easy to pull off. While nine U.S. states have legalized recreational cannabis and many more allow medicinal marijuana, it remains illegal at the federal level. Cannabis producers can't ship product across state lines, or access financing from major banks. The current White House has expressed hostility towards the industry. U.S. border officials are reportedly giving cannabis execs a hard time. Faced with that reality, Aurora is actually distancing itself from the U.S. industry. It spun off its U.S. holdings into a separate company earlier this month, and Battley stressed his company does not have "any U.S. operations or assets right now." For publicly traded cannabis firms, it's crucial to avoid the perception that they may be involved in an illegal activity in any jurisdiction. But Aurora's not abandoning all hope — it has a deal in place with the U.S. business it spun off, allowing it to buy back in if cannabis is legalized in the U.S. in the next 10 years. So the Canadian invasion of American marijuana may not be quite as imminent as some think. And some observers say it's a mistake to count the U.S. industry out. "I would never bet against the U.S. in terms of their ability to catch up," said Mark Whitmore, vice-chair and global leader for consultancy Deloitte Private. While Whitmore holds a bullish view of the Canadian industry — he was behind a 2016 report estimating legal cannabis would be worth $22 billion a year to Canada's economy after legalization — he is also optimistic about the U.S. He noted that California, which has legalized marijuana, "is as large a market on its own as Canada. It's always had an innovative and progressive economy." And he cited a common adage heard in the global investor community: Anyone who has bet against the U.S. in the past few centuries has lost. But he notes that it all depends on how the political situation will evolve. "The big question mark still is where does the U.S. go on the whole topic of cannabis?" In the meantime, Canada will be "leading a global megatrend," Battley said. "Thus far we've done very well at getting it right. I think we're going to change the world in a very positive way."